Help at last! A FREE database with all the references to the Saints and their cult before 700 AD! For the last few weeks I have been trying to find out about St George. Starting from nothing, I want to know when the first mentions of him are, what literary texts are available, etc. It’s been amazingly hard work, poring over century-old German monographs, the Acta Sanctorum, trying to find more recent works, and so forth. Hagiography is dreadful to work with; and where on earth do you start, trying to find out inscriptions and church dedications? Who knows?? Not everything is completed yet. The greyed-out entries – which are still useful, note – are yet to be written. But so much is done. Each entry is a text, a translation into English, some discussion, maybe a photograph if they had one, and a very up-to-date bibliography. Note that this is not just Greek and Latin; Armenian, Coptic, Syriac and Georgian sources are also included! Since I have been searching for some time for information on one inscription, I am painfully aware of how much labour must have been undertaken to produce an entry far more up-to-date than anything that I had been able to obtain. Frankly it’s gold. You will save yourself so much effort. I have yet to use it for its design purpose, tho, of picking up cross-references. This, I imagine, is where the database design will really pay dividends for researchers. I heartily approve. The entries are becoming visible in Google, which is how I became aware of the project. 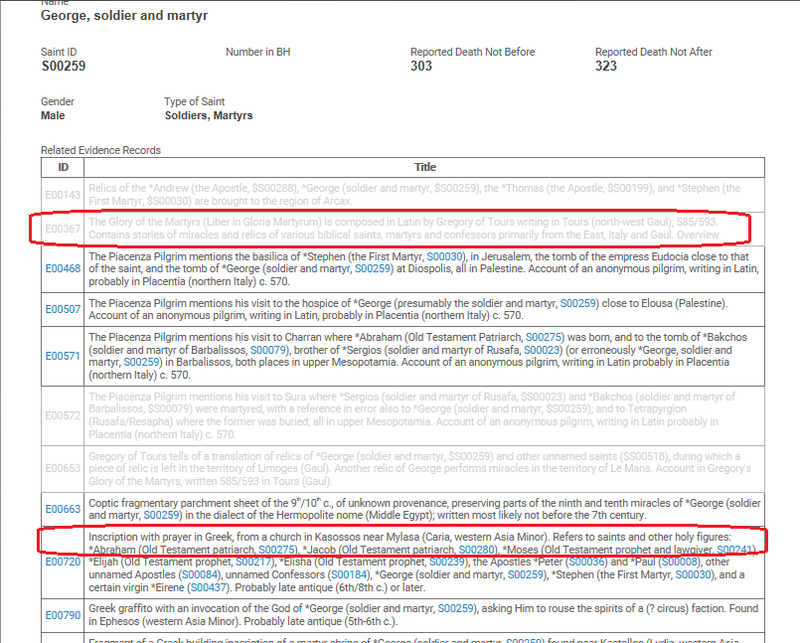 Make your obscure query for some Syrian church, and you may well get a line from this database appear. I hope that the links are indeed permanent, for this is quite a resource. Usefully each page indicates how it should be referenced for publication (although more should be done to this, I think). I hope that the pages get archived at Archive.org as well; the last thing we need is for material to vanish offline in 5-10 years time. If you have any interest in hagiography at all, you need to get familiar with this site. It’s simply the best tool to hit the hardware department since the Acta Sanctorum. The contributors are listed here; many of the names will be familiar, all doing very good work. The project leader is Bryan Ward-Perkins. I truly approve of this site. It’s accessible to ordinary chaps like you and I, all around the world. It’s something that would have been unthinkable before the internet. Johannes Bollandus and Daniel Papebroch would have given their eye-teeth for it. This site almost justifies the existence of Oxford University all by itself; for it gives access to the fruits of so much learning to so very many more people than could ever research it themselves. Words fail me. Use it. “The Cult of Saints is supported by an Advanced Grant from the European Research Council under Grant Agreement Number 340540.” Hooray for Brexit. Seriously though: fantastic resource. Thank you for the info! Many thanks – this is magnificent! It is rather dumbfounding that one has never heard a word of it before – as if, like Auden’s remark on “the dreadful martyrdom” in an Old Master’s painting, it “must run its course / Anyhow in a corner” with keenly interested “ordinary chaps like you and I” quite unaware – but then, since, as Dr. Ward-Perkins tells us, “On All Saints’ Day 2017 it launched its freely-available online database of the evidence”, it would have been wildly tantalizing to have know of its inaccessible existence since it “launched in January 2014” for the nearly four years until then. I’m surprised that they have clearly not had the attention they deserve. For it is a marvellous resource.